Today, I visited my bff's home, Ria. I went there with Maria. It was unplanned visit, actually. Haha. So, I took my phone and called my daddy to ask his permission. And my daddy permitted me to play in her house. Yeay! And what did we do in Ria's house? We watched 2 movies instead of making project! Two teenage best friends, Claire (Emma Roberts) and Hailey (Joanna "JoJo" Levesque) regret that they will be separated in five days, since Hailey has to move to Australia because of her mother's job. One night, after a violent storm they find a mermaid, named Aquamarine (Sara Paxton) in the swimming pool of their beach club. The girls are frightened at first, but then curious. They start to talk with Aquamarine and promise her they will be back in the morning. 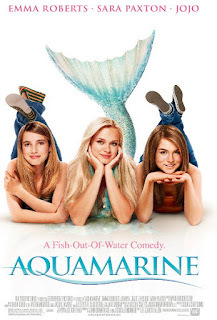 When they return, they find Aquamarine in the beach's snack shack, but with a human body instead of a mermaid's. Aquamarine tells them she can assume human form on land during the day if she does not get wet. Claire and Hailey be friend Aquamarine, who tells them that she came to land to find love, an idea she knows nothing about, but desires desperately. She tells them that she made a deal with her father: if she finds love in three days, she will not undergo an arranged marriage. She immediately notices a handsome lifeguard named Raymond (Jake McDorman) and enlists the help of the two girls to win his heart in return for the granting of a wish. The girls see their opportunity to keep Hailey from moving and immediately start helping her. Sixteen-year-old Poppy Moore (Emma Roberts) has always got what she wanted and lives a pampered life in her L.A. world. Though she's handed credit cards with unlimited balances and surrounded by countless hangers on, Poppy can't escape the mounting frustration she feels with her family situation and she makes sure everyone knows it. After an over-the-top prank pushes her father (Aidan Quinn) one step too far, Poppy is shipped off to an England boarding school called Abbey Mount. Finding herself in a foreign world of early curfews, stern matrons, and mandatory lacrosse, the American princess has finally met her match: a school of British girls who won't tolerate her rebellious ways. Under the watchful eye of the school's headmistress (Natasha Richardson) and surrounded by a new circle of friends (Josie, Kate, Kiki & Drippy), Poppy begrudgingly realized her bad-girl behavior will only get her so far. But just because she must grow into a fine young lady doesn't mean this Wild Child won't be spending every waking hour shaking up a very proper system. Poppy Moore starts Abbey Mount as she means to go on-her way, or no way. Realizing her Dad's not coming back to get her, and having nowhere to fit in, room-mate Kate tells Poppy she'll have to get herself expelled. Later that night, Poppy reads a book (Alice In Wonderland - her punishment for fighting) with a lighter when her room-mates sneak up on her with torches, and offer their help. They give their ideas on how she can get expelled, and act on them as a group, and let her take the blame. This brings the girls closer, but Poppy still wants to leave. When none of the plans to get Poppy expelled are working the girls realize they will have to go all out and hit the headmistress closer to home by snogging her son Freddie, which is completely forbidden by the school. After some flirting, Freddie asks Poppy out on a date, during which they kiss. Before going out with Freddie, Poppy is so excited she doesn't log off the computer, and runs off. Harriet takes her revenge on Poppy by rewriting her emails to best friend Ruby, and sticks one on the girls' door, suggesting that Poppy is just using them and is faking the friendship. Harriet also rewrites an email about Freddie, stating Poppy's plan to kiss him only to get expelled and that she thinks he is a loser. Coming back from her night out, Poppy is ready to confess she's actually happy, to find the girls upset. They read the email to her and leave. Upset, Poppy goes to see Freddie but he has found the email about him also and feels betrayed. Poppy, with no one else to turn to, sneaks down to the cook's room to use the phone and rings Ruby, who it turns out is sleeping. Even more alone, Poppy starts playing with her lighter, setting a curtain alight. Hearing footsteps, she quickly puts out the fire and runs off. A few minutes later, she looks out her window to see a fire, and wakes Kate and the rest of the school. After the fire is put out, Freddie looks at the damage and finds her lighter. He gives it back to her, refusing to listen to what happened. Poppy goes to the headmistress and confesses. Poppy also asks Mrs. Kingsley to give a letter to Freddie apologizing and confessing her feelings about everything. Comment : The plot is just awesome! This movie told us a lot about school life in England. And we could never stop scream : "Kyaa~ Alex Pettyfer ganteng banget! Keren! Cool! 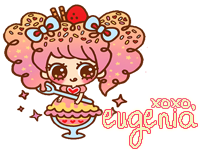 blahs blahs~~"
Well.. change the topic to the accident of Air France airlines which was missing over Atlantic. PARIS/RIO DE JANEIRO (Reuters) – An Air France jet disappeared after hitting stormy weather over the Atlantic Ocean on Monday and all 228 people on board were feared dead. France and Brazil sent military planes and ships to scour a vast area of ocean where the Airbus A330 jet may have come down during the flight from Rio de Janeiro to Paris. But officials said there was little chance that anyone could have survived. If no survivors are found, it would be the worst loss of life involving an Air France plane in the carrier's 75-year history. An Airbus A330 has never been lost during a commercial airline flight and it is extremely unusual for an airliner to be brought down by storms. The plane was carrying 216 passengers of 32 nationalities, including seven children and one baby, Air France said. Sixty-one were French citizens, 58 Brazilian and 26 German. Twelve crew members were also on board. Brazil's air force said it was investigating a report that a jetliner flown by Brazilian carrier TAM had spotted debris in the ocean in Senegal's air space on a flight from Europe to Brazil. Brazil's Vice-President Jose Alencar also mentioned the report, saying the TAM pilot may have seen "something on fire" in the ocean. TAM was not immediately available for comment. The Air France jet flew into storms and heavy turbulence four hours after take-off from Rio and 15 minutes later sent an automatic message reporting electrical faults, the airline said. There was no sign that the crew had sent a mayday message or any indication that signal-emitting emergency locaters had activated on impact as is normally the case in crashes. The company said a lightning strike could be to blame and that several of the mechanisms on the Airbus 330-200, which has a good safety record, had malfunctioned. The news was shocking me a lot! I watched on the TV that after the plane flew into storms and crashed the heavy turbulence soon the plane was gone. How pathetic. They were missing over Atlantic! How could it be possible to found? Well.. just God who knows. Let's pray and hope there will be some survivors. 18 days till my upcoming "DAY"
What Do You Want More On This Blog?